Peters took his own life. He was 55 years old. No one knows what triggered Peters’ sudden shift in mood and behavior. But since her husband’s death, Ginnie Peters has been on a mission to not only raise suicide awareness in farm families but also draw attention to the growing evidence that pesticides may alter farmers’ mental health. Farming is a stressful job – uncontrollable weather, physical demands and economic woes intertwine with a personal responsibility for land that often is passed down through generations. 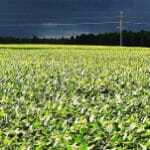 But experts say that some of the chemicals used to control pests may make matters worse by changing farmers’ brain chemistry. Recent research has linked long-term use of pesticides to higher rates of depression and suicide. Evidence also suggests that pesticide poisoning – a heavy dose in a short amount of time – doubles the risk of depression. Depression is the most common mental disability in the United States. About 7 percent of U.S. adults annually experience at least one two-week or longer stretch of depression, according to the National Institute of Mental Health. There is no national data on whether farmers and their workers are more prone to depression. The causes are complex. There “are millions, even billions, of chemical reactions that make up the dynamic system that is responsible for your mood, perceptions, and how you experience life,” according to a Harvard Medical School report. Some research suggests that the chemicals that farmers and their workers spread on fields may alter some of these brain chemicals. Peters and his wife were among 89,000 farmers and other pesticide applicators in Iowa and North Carolina who have participated in the Agricultural Health Study led by the National Institute of Environmental Health Sciences. Last month, epidemiologist Freya Kamel and her colleagues reported that among 19,000 studied, those who used two classes of pesticides and seven individual pesticides were more likely to have been diagnosed with depression. Those who used organochlorine insecticides were up to 90 percent more likely to have been diagnosed with depression than those who hadn’t used them. For fumigants, the increased risk was up to 80 percent. “Our study supports a positive association between depression and occupational pesticide use among applicators… and suggests several specific pesticides that deserve further investigation in animal studies and other human populations,” the authors wrote in the journal Environmental Health Perspectives. The major strengths of the research are its large number of participants and its detailed pesticide exposure data, said Stallones, who was not involved in the study. The applicators were asked about depression when enrolled in the study and then again around 2010. Most previous studies only asked once about depression. Similar results were found when Kamel and colleagues analyzed the same group from 1993 to 1997. Farmers with the highest number of lifetime exposure days to pesticides were 50 percent more likely to later have a depression diagnosis. The studies don’t prove that pesticides cause depression, but animal testing indicates that it’s possible, said Cheryl Beseler, an environmental health researcher at Colorado State University. In rat tests pesticides have altered brain cells, neurotransmitters and production of a protective acid. In France, farmers who used herbicides were nearly twice as likely to have been treated for depression than those who didn’t use herbicides, according to a study published last year. The study of 567 farmers found that the risk was even greater when the herbicide applicators had been doing it for more than 19 years. The studies suggest that chronic exposure to low levels over time may raise the risk of depression. Colorado farmers who suffered pesticide poisoning – a large dose in a short period of time – had double the risk of depression during the next three years. In addition, pesticide applicators in the North Carolina and Iowa group who suffered pesticide poisoning were 2.5 more likely to later have a depression diagnosis. Most insecticides work by disrupting insects’ nerve cells. At high enough doses, they can alter human nerve cells as well. For instance, Dr. Beate Ritz, a neurologist and professor at the University of California, Los Angeles, found that Californians exposed to pesticides are more likely to have Parkinson’s disease. One effect of the neurological disease, characterized by a lack of the chemical dopamine, is depression. Melani Forti, director of health and safety programs for the Association of Farmworkers Opportunity Programs, said one of the biggest challenges in protecting farmworkers is a lack of scientific evidence for health impacts from pesticides. Wendy Ringgenberg, an assistant professor at the University of Iowa, combed through 19 years of national data and reported that farmers and farm workers were 3.6 times more likely to die of suicide than other professions. 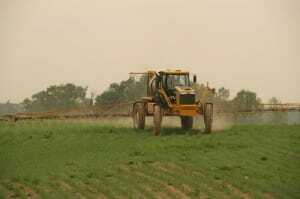 Several studies have linked suicide to pesticide use. In Brazil, workers that used more pesticides were more likely to commit suicide, and in China, a World Health Organization survey of 9,800 people in the rural Zhejiang province revealed that those who stored pesticides in their homes had more than double the risk of having suicidal thoughts. However, the study did not examine the causes of suicide. Migrant and seasonal farmworkers face stresses related to working conditions, cultural barriers and being away from home and family, Forti said. The seven individual pesticides that were linked to depression diagnoses in Kamel’s study were the fumigants aluminum phosphide and ethylene dibromide; the phenoxy herbicide 2,4,5-trichlorophenoxyacetic acid (2,4,5-T); the organochlorine insecticide dieldrin; and the organophosphate insecticides diazinon, malathion and parathion. Of those, “only aluminum phosphide, diazinon, and malathion are still registered and in use,” Cathy Milbourn, a spokesperson for the Environmental Protection Agency, said in an emailed response. The EPA cancelled the registrations of ethylene dibromide, 2,4,5-T, dieldrin, and parathion, Milbourn said. Aluminum phosphide, diazinon, and malathion are undergoing EPA review. Three of the largest pesticide manufacturers – Monsanto, Syngenta and Bayer CropScience – said that they do not produce the seven pesticides linked to depression in Kamel’s study, but none would comment on the broader issue of mental health and pesticide use. Many developed countries, including the United States, have phased out organochlorines and organophosphates, but Stallones said regulations do not fully protect workers. Neonocotinoids– the newer class of pesticides that Matt Peters was handling when he committed suicide – weren’t included in Kamel’s study. However, they are suspected of causing bee die-offs because they harm bees’ brains and nervous systems. The chemicals’ impacts on humans are unknown since no studies have been conducted. Peters was heavily exposed to other pesticides, too, including organophosphates, his wife said. “Matt did almost all of his own spraying of the crops,” she said. Ginnie Peters remembers her husband as an even-keeled, kind, loving man who made it a point to treat younger farmers and farm workers with respect. A fourth-generation farmer, he left behind a son and daughter. His grandfather, also a farmer, suffered from depression as well. When he died, it “messed with every piece of my being,” she said. While there is no evidence to blame the pesticides Peters was handling on his Dallas County farm, Stallones said it’s possible he was poisoned because depression symptoms can show up suddenly after a large dose. But when Rossman and Ginnie Peters sent his blood in for chemical analyses, they were unable to get results due to complications at the medical examiner’s office. 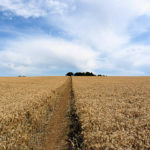 An adjunct professor in environmental and occupational health at the University of Iowa, Rossman said many farmers are open to hearing about the possible dangers of pesticides. But economic realities remain. “Even if they hear my message, they have to make choices: Do I need to use this chemical for the good of my farm, or do the negative factors – what it could be doing to the insects, food supply and possibly people – make it not worth it?” he said. Ginnie Peters tries to cope by mounting her new mission: bringing suicide out of the darkness and drawing attention to the chemicals that could be playing a role.